Measured drawings of multistory buildings and residential spaces are something that I create often. In this post, which I’m publishing as another in my series of project summary posts, I’ll discuss a project of this nature. An NYC Architect, who in the past I did an existing site survey for, contacted me to request an existing site survey of a residential apartment located in a building on the Upper East Side (UES) of Manhattan. An “existing site survey” is another term for “measured drawings”. Door widths/heights (to face of jamb). Window widths/heights (to face of jamb), sill height, exterior wall thicknesses. Bath fixture locations and sizes, centerlines to sink/toilet/tub/shower plumbing. Radiator locations, radiator sizes, riser locations. Plumbing/steam riser locations if exposed. A reflected ceiling plan with ceiling beam dimensions/locations. As I mentioned, I had done work for this Architect before, so I pretty much knew exactly what he wanted. Therefore I submitted a proposal to him, he approved it, and I scheduled a day to access the apartment. Type and Location: A residential apartment located in New York City, NY. 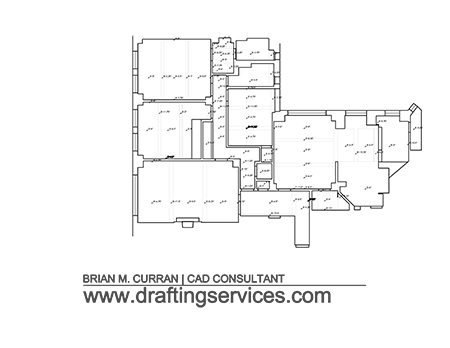 Scope of Work: Create a measured floor plan and reflected ceiling. Floor Plan Area: 1,748 sq.ft. Access Restrictions: No. Someone met me onsite and unlocked the vacant apartment for me. At the end of the day I merely pulled the door closed behind me when I left, and then as I left the building I let the doorman know that I was finished in the apartment. Field Setup and Breakdown Time: This time is lumped into my field time. For a project like this it typically only takes me about ten minutes to setup, and then 10 minutes to pack-up at the end of the day. Total Travel Time: I made two visits to the site, each of which took 2.00 hours round trip. Therefore 4.00 hours was my total travel time. Misc. Time: Approximately 1.00 hour of project coordination. Comments: This was a fairly reasonable space to measure and draft. The layout was not complicated, nor dense. 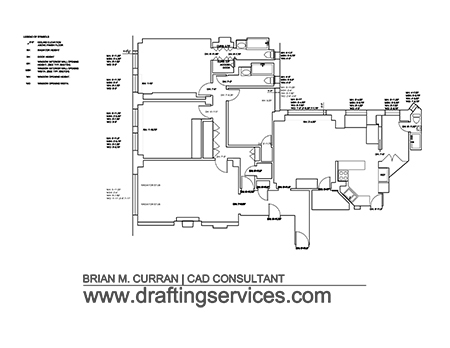 A project sample of floor plan measured drawings. A project sample of reflected ceiling plan measured drawings. That’s all for this project summary post. Please check back in the future for more such posts! ← Freelance Drafter or Not? It seems unusual to me to see 8′-11.5″ — I would use 8′-11 1/2″. Perhaps it’s an east coast / west coast thing. Some of the text in your dims of your pdf are in a heavy lineweight. I had this problem and it drove me crazy. I found one cause was if I created the text/dim on a layer with a heavier lineweight and then moved it to the dimension layer. AutoCAD seemed to keep the lineweight from the creation layer. I don’t think that was the only cause though. I cured it by printing my PDFs through a free program called CutePDF (http : // cutepdf .com). All PDFs then printed without the problem and with much smoother text too. I used it for ACAD 2008 and 2010 — I recently upgraded to ACAD 2015 and it prints fine for me without that program. Anytime Dunn. I used to do these posts regularly, but over the years switched to doing short videos. Yes, the line weights in the PDFs did not come out well. I don’t know what print driver I was using when I wrote the post. I have tried cute, thanks for the tip anyway. I actually find the native DWG to PDF driver to be the best with my version of 2012.